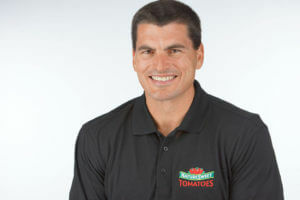 Bryant Ambelang – president and CEO of NatureSweet Brands LTD, the world’s largest greenhouse producer of tomatoes – will be the Forum on Entrepreneurship Breakfast Series keynote speaker Thursday, Sept. 28. Ambelang held several positions at Kellogg’s and Pace Foods before joining NatureSweet. He has a bachelor’s degree from the University of Texas at Dallas and an MBA from the University of Denver. “Mr. Ambelang’s success story driven by a very focused strategy is an inspiring one that will resonate with our audience,” said Chris Edelen, St. Mary’s Executive in Residence and Chairman of the Breakfast Series. NatureSweet operates seven production facilities — six in Mexico and one in the U.S. — and focuses on being the “groundbreaking leader of the fresh tomato industry driven through Unleashing the Power of People.” NatureSweet has nearly 8,000 full-time associates who are “experts on growing the best-tasting tomatoes in the world and know how to manage plants to provide flavor 365 days a year.” Ambelang says the associates are the inspiration behind the “Tomatoes Raised Right” campaign. NatureSweet’s Cherubs, Glorys, Sunbursts, Constellation, Jubilees and Eclipses brands are distributed in all 50 states, as well as in Canada and Mexico, and have achieved 80-percent brand awareness as the world’s most widely recognized tomato brand. Dennis Noll, CEO of the San Antonio Area Foundation, will be the featured speaker at the next Forum Breakfast event on Thursday, Nov. 30. At the previous event, in April, the Forum Breakfast series featured Mike Howard – Chairman and CEO of Howard Midstream Energy Partners, LLC. Past speakers include Daymond John, “Shark Tank” investor and founder of FUBU; Colleen Barrett, president emerita and corporate secretary of Southwest Airlines; Stuart Parker, CEO of USAA; Paula Gold-Williams, CEO of CPS Energy; and Bill Greehey, chairman of NuStar Energy, L.P.